We are working to prevent malaria in South Sudan and improve access to diagnosis and treatment of the disease. Through an innovative pilot scheme, we have been working with the Ministry of Health to assess the effectiveness of community based distribution of mosquito nets. Access to prompt and effective treatment is a key challenge to improving health care in South Sudan, especially in rural and hard to reach areas. Malaria Consortium is working with the government of South Sudan Ministry of Health to address this issue and bring health care to rural communities through integrated Community Case Management (ICCM) programmes. The ICCM programme involves training elected community members in basic health skills, including the diagnosis and treatment of common childhood illnesses – malaria, diarrhoea and pneumonia – in children under five. 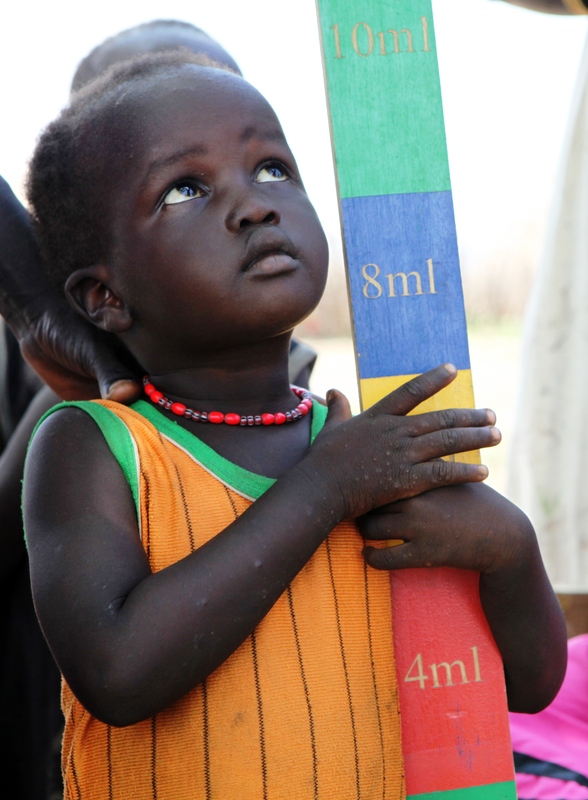 In South Sudan, where malnutrition is a major problem especially in returnee camps in the north of the country, Malaria Consortium is running an innovative programme to assess and treat malnutrition at the community level. Community workers are trained to diagnose and treat malnutrition using the already established ICCM networks. This extends the reach and allows severe cases to be referred earlier. By addressing the causes and effects of the three leading causes of death in children, the nutrition programme aims to have a positive impact on childhood mortality. Recent Malaria Consortium SMART surveys during the ‘hunger gap’ of 2012 have flagged worrying GAM and SAM rates, allowing emergency humanitarian actors to step up, demonstrating the importance of our research in this fragile context. Malaria Consortium’s technical staff provides broad support to the Ministry of Health in South Sudan, ranging from policy development to training for health workers. Health systems strengthening also include training in Health Management Information Systems (HMIS) and Integrated Essential Child Health Care (IECHC) at County Health Department level. Malaria Consortium has supported the Ministry of Health to implement a national programme for integrated Neglected Tropical Disease (NTD) control since 2007. Past programmes have focused on conducting rapid assessments, mapping, surveys and subsequent mass drug administration where NTDs are found. 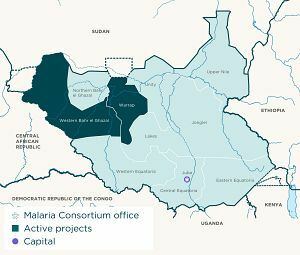 Malaria Consortium conducts health research and also assists the Ministry of Health to map, review and synthesize all research carried out in relevant areas in South Sudan. After the Comprehensive Peace Agreement was signed in 2005, the Ministry of Health requested Malaria Consortium’s assistance to support the development of its policy environment and evidence base. 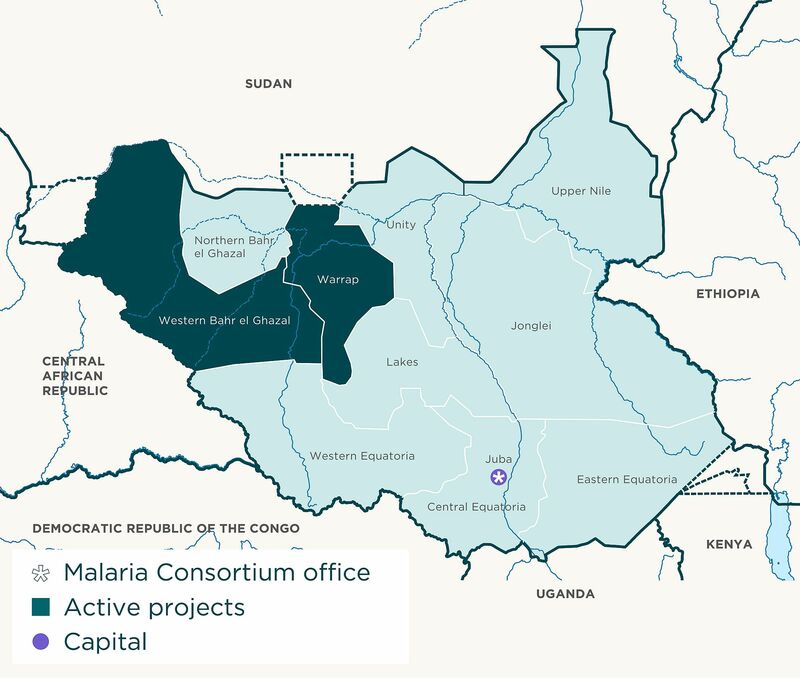 The South Sudan Malaria Control Strategic Plan was developed with technical support from Malaria Consortium and fed into the 2011 Health Sector Development Plan. We have since been involved in developing ICCM guidelines and ‘harmonisation’ of ICCM training materials between all partners and the Ministry of Health.